Previously decorated in traditional style, but a refurbishment some time between 2009 and 2013 has brought a younger and more lounge-like style. The interior configuration is a little unusual due to its location on the side of a steep hill — there are bars on two levels, with steps between. There's a beer garden out the back. Kake and bob first visited on a Sunday Bank Holiday afternoon/early evening in August 2009. Five real ales were available; London Pride (£3.16/pint), Bombardier, Brakspear Bitter, Greene King IPA, and Courage Best. The Pride was fine. The upper (public) bar was very crowded, so we sat in the lower (lounge) bar, where there were tables available throughout our visit. A couple of flatscreens were showing Twenty20 cricket. There was no music, but plenty of animated conversation. Kake and friends visited again on a Saturday early evening in October 2013. There were three or four real ales on, including London Pride and Young's Bitter. We again sat in the lower bar, which was fairly noisy. According to their website as of October 2013, food is served noon-4pm Mon-Fri and also on Sundays. The 2009 Good Beer Guide advertises a monthly quiz on Wednesdays, though we aren't sure if this is still going. 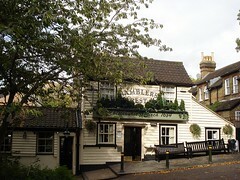 Kake's verdict: It was probably my favourite out of the half dozen Chislehurst pubs we visited on our 2009 trip, but the refurb isn't really to my taste. Accessibility: Steps everywhere, and it's on the side of a pretty steep hill. Two or more steps up to get in, three steps between the two sides of the bar, three steps up to get to the toilets. Last visited by Kake and friends, October 2013. Opening hours taken from the 2008 Good Beer Guide. Last edited 2013-10-28 16:22:31 (version 14; diff). List all versions. Page last edited 2013-10-28 16:22:31 (version 14).